Add this to your Ravelry Queue and Favourites! 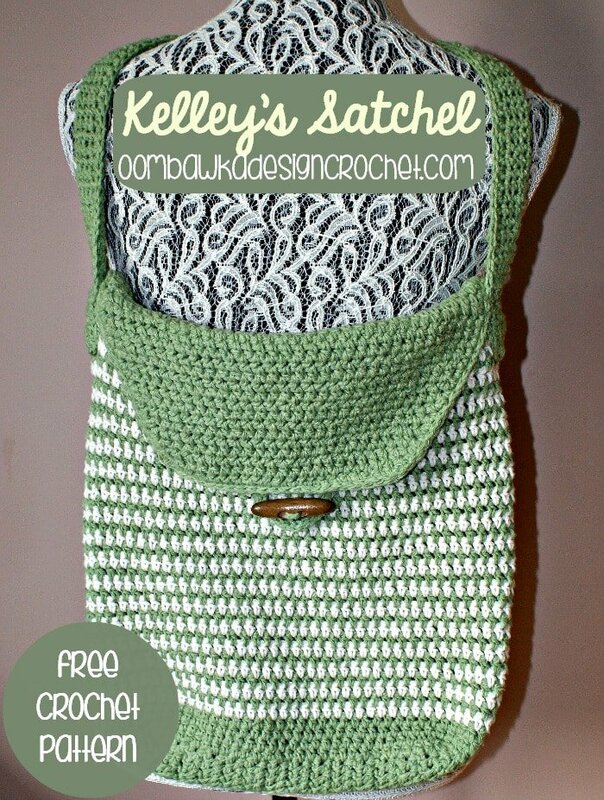 Share this free crochet pattern with your friends! For my sister’s bag, I used a solid colour for the base. If you would prefer the base of your bag to be stronger (i.e. do you want to carry library books in this bag?) then finish off and weave in the ends. Repeat the base of the bag instructions a second time and do not fasten off. Now you will be working around the outside of the bottom of the bag rectangle. R1: turn 90 degrees, 1 hdc in each row end , ch 1, turn 90 degrees, 1 hdc in each st space across , ch 1, turn 90 degrees, 1 hdc in each row end , ch 1, turn 90 degrees. You may wish to have a stitch marker handy from this point on as you will now be working in continuous rounds. You will not be slip stitching to join, or chaining to increase the height of the rows. If you would like to make the colour changes as I have, you will need to bring the new colour up on the last yarn over on the last stitch of each round. I did this on every round until I reached the flap section of the bag. You will now be working in a rows. I chose to do the flap in a solid colour for contrast. You will now be working around the outside of the flap and around the opening of the bag. R21: 1 sl st in each st sp around (and row end around), finish off and weave in ends. I wanted to reinforce my button clasp and straps so I crocheted little squares (as follows) and stitched them into the inside of the bag. This allowed me to work into this ‘back-up’ piece of crocheted fabric when adding the button clasp and the straps. I find doing this protects the bag stitches from stretching and gaping with the weight of the bag. Repeat R2 until your strap measures the length you want for your bag. 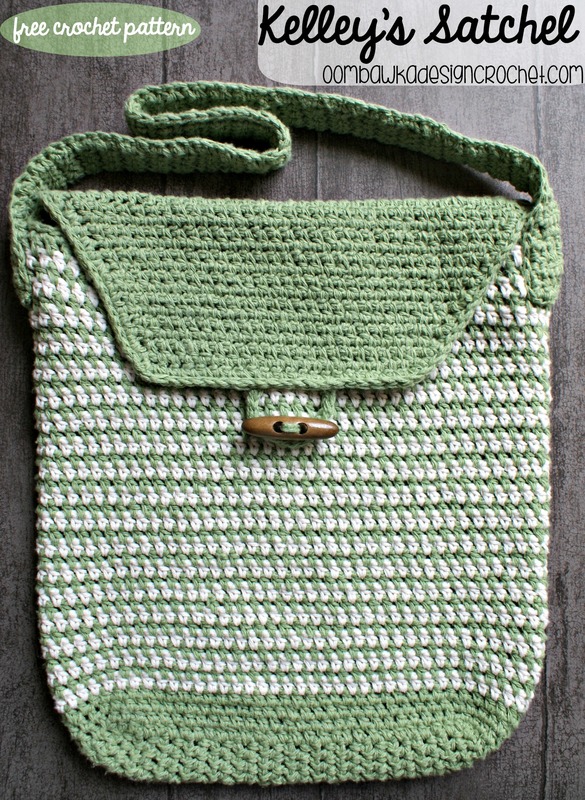 For my sister’s bag I crocheted the strap to a length of 24″. This allowed 20″ for the strap and 2″ to join on each side to the bag. 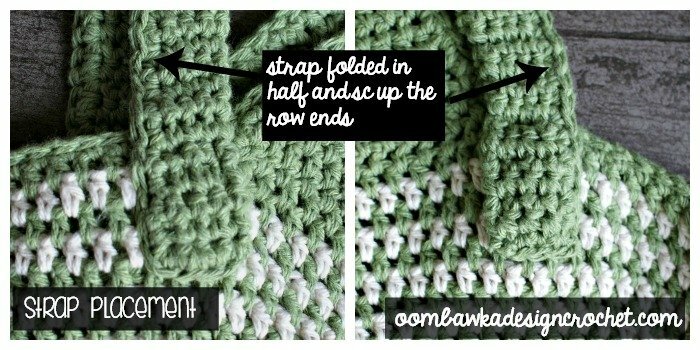 Now fold your strap down the center (to make a narrow strap) and single crochet up the row ends, finish off and leave a LONG tail for sewing the straps to the bag. Turn your bag inside out. 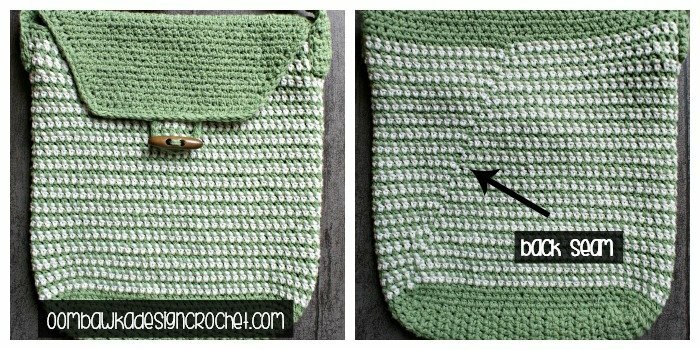 Fold your bag in half down the center to find the middle stitch on each side. It should be very close to the starting point for the flap. Sew the reinforcement pieces (if you are using them) to the inside of the bag around the outside of the rectangle shape. I stitched mine through the inside loops of the stitches of the bag. Do this on both sides before turning the bag right-side out. When I attached my straps I sewed around the outside edge of the strap only. I used a wooden button I received from Wholeport (4 cm by 1.1 cm). I found the center two stitches of the purse a row below where the flap reached. I added the reinforcement piece to the inside of the bag and then sewed the button into the reinforcement piece. Finish off leaving a long tail to attach the strap for the closure. Attach the closure strap approximately 5 sts apart on the underside of the flap. I hope you love this bag as much as I do!! hey rhondda how are you. i was trying to crochet this bag but i don’t understand the bottom of the bag instructions. I did the 10fhdc but it look so short and small it’s about 2inches long? is it suppose to be that short? I was looking around on Pintrest for totes and other projects to take along in said tote and found this cute pattern. The name of it sealed the deal for me! After all tote with my name on it just begs to be made! I’ll be starting on this one ASAP! This is super cute!! I love this pattern! Thank you! This bag is really cute thank you for sharing the pattern! I absolutely love this bag. It’s my summer project, ready for when we go on holiday. Love this bag! How much yarn did you purchase for the project? Beautiful satchel! Love it!! On my list to make!! Love this, going to try it soon! I love this bag, thanks so much for sharing! Thanks Sharon 🙂 My sister seems to love it thankfully!